If you build Scotia Square, it will save downtown! 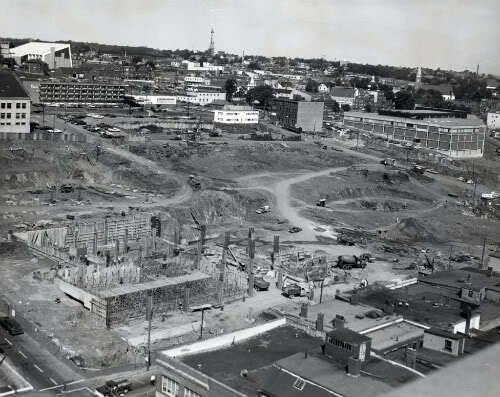 Market Street around 1967, as construction starts. Sadly neither group seems to reflect either the concerns of the average folk on the street, or worry about how this process seems to be turning our politics back several decades. To the first point, I think the majority of taxpayers want some kind of new convention centre, but have concerns about this specific proposal. Personally, I don’t buy the assurance without figures and facts and third party studies that “Canada’s market is different from America’s”. It is important that the markets be different because the US convention market is in free fall, with an over-supply of convention floor space, and not enough demand to fill it. Even if we accept the demand will be there, there is plenty to fear in this proposal. The Canadian Taxpayers Federation, a group I only rarely agree with, condemned the proposed deal. “Having taxpayers pay to build a new trade centre, only to have it leased back to them, is like buying a new house, being forced to pay rent while you live there and when you move out you can’t even sell it,” said Kevin Lacey, Atlantic Director of the Canadian Taxpayers Federation. On top of that, it seems other municipalities can build convention centres for the same money and own them outright. The Coast reported the four story, larger, signature building in Ottawa is going up for a projected $170 million. What if the Canadian market is in fact exactly like the US market? Vancouver built a convention center for $800 million, and faces the same issues as Halifax in terms of being at an extreme end of the country in terms of travel. The Georgia Straight reports Vancouver convention traffic has drop year after year since the expansion, failing to reach any of the consultants projections. To the second point, there has to be concern about what this debate says about us politically, about our political culture. Let’s be clear: media, pundits and concerned citizens have been asking for a business plan for this facility. A quick review – a business plan has several sections, including a financial section that shows revenue and expense in the form of an Income Statement, and assumptions that support that Income Statement. The response has been a seeming lack of understanding (just read the consultant reports, they say, but those only address demand) or accusations of lack of vision (think bigger, don’t get mired in the details!). There simply is no clear picture of the total cost the taxpayer to operate this center, the real sustained yearly impact on the provincial governments bottom line, and what kind of revenues are required to keep this cost from increasing. We live in a province being crushed by the weight of our debt. We acquired that debt during the high spending, damn the consequences days of the Buchanan government, and then watched the situation get manifestly worse when Cameron and MacLellan tried to buy votes with voters own money. It is not forward looking to approve of a project that will be a great expense to the citizens of Nova Scotia without a fully developed and publicly available business plan. It is not insular and misguided to continue our ongoing struggle as a society to move away from the old small minded pork barrel politics that almost bankrupted the province two decades past. We do need a new convention centre. There is even a remote chance we may even need THIS convention centre. What we do not need, and can never accept, is this lack transparency and accountability. Until these obstacles are overcome, the municipality, the province and a government agency are at this time are asking for a commitment of literally untold millions on faith. If “build it they will come” worked, Nova Scotia would already be rich beyond our wildest dreams due to the efforts of many past wild spending governments. We might need vision, but it can’t just be old politics wearing a new dress. You can dress it up and describe it any way you want, but the convention centre as proposed, and the campaign to support it, is simply putting lipstick on the proverbial old boy, back room, pork barrel pig.